Here's some pictures and facts about baby tigers. Tigresses are very cautious and protective about their cubs. Tigresses will risk their lives and have charged at people who are inadvertently too near the den. The cubs are usually moved by the tigress to a safer area. Even in tourist areas where tigers are used to people being around, tigresses will "disappear" with their offspring during the first months of their lives. I'd like tigers to stay small and like a cat. But they grow up and they are a whole different type of animal. It'd be f**king awesome to have a tiger as a pet. We all have this kind of problem with baby tigers. We love them terribly. They are fantastically cute. We want to own one and cuddle it. This is partly because we know that this is a very strong and dangerous animal in the making. That makes the vulnerable baby tiger even more attractive and cute. Then as is so often the case, when they grow up we sort of lose interest. We forget about them. We are scared of them as well. But the reverence for them remains. This apathy about the adult tiger and our reverence and admiration of it means it is abused by people who want to profit from it. This is why the tiger is a very endangered species of wildcat. Our admiration for tigers also means that there are more pet tigers in America (12,000 or so) than there are wild tigers (about 1,400 Bengal, 400 Sumatran, 400 Siberian, South China 20). That is the way of the world. Tiger cubs weigh about 2-4 lbs. at birth. The raising and feeding of baby tigers by people is pretty technical stuff. And there is little hard detail on the internet about it. This is a very complete article however: Feeding Baby Tiger Cubs (this takes you to a different website on a new page). There is an interesting story about a one year old captive South China tiger who couldn't see because he had cataracts. On this occasion I must praise the Chinese as a surgeon operated on the tiger to restore sight. I have been critical of the China tiger farms etc. However, the reality is that the poor eyesight of this tiger cub is probably due to inbreeding. Inbreeding of tigers in captivity is a real problem and not often realised by people who are not involved in rearing captive tigers. The reason is low tiger populations in the wild is due to the depletion of habit and poaching to supply the tiger body part trade as major reasons. Sad isn't it. The typical litter size for a tiger is 3 - 4 cubs. Baby tigers are born blind and helpless. The female rears the cubs alone. 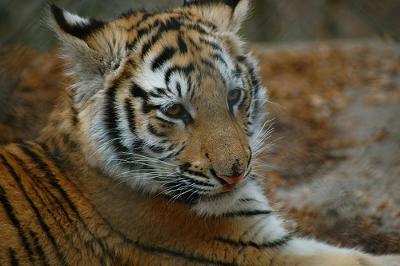 About half of all tiger cubs in the wild do not make it beyond 2 years of age, a high mortality rate. Infanticide (adult males killing cubs) occurs sometimes at the site of kills. At about 8 weeks the babies explore, leaving the den and following their mother to a hunt but not joining her on it. At about 18 weeks they are more independent and about the size of a medium to large dog. They are weaned at about 6 months of age. They might do a bit of hunting of small animals at this stage but they don't have the permanent canine teeth to kill and eat larger prey. At about 2+ years they become independent. Photos: published under a Attribution-NonCommercial-NoDerivs creative commons License -- this site is for charitable purposes in funding cat rescue. This looks so cute!!! !!!! i love tiger babies but they are rapidly decreasing in number say a tiger baby is born it enjoys with its mother one day its mum goes to bring food for her it keeps on waiting for her suddenly it hears a sound what sound? sound of a hunters gun, can u imagine what might have happened there and will the mother tiger ever return to her kid with food say what do you feel? should baby tigers get orphans in the jungle since the greedy humans have killed its mom and maybe dad also for tiger claw brooches,their skin,teeth.nail,and what not.even some people kill tiger for a merry sport. i say if u like tiger just have some time to see the film "TWO BROTHERS". i can not believe how cute they are! I don't care if I spelt that word wrong. Tigers are my favorite animal. Note: you spelled the word correctly. And I am pleased that you like tigers. Try and save them please because they are being killed in Asia faster than they can be created....Michael (Admin). Omg that baby tiger is so cute!! !that's the cutiest thing I ever saw.if they weren't wild I would take it home as a pet.!!!! Feb 11, 2011 BABY CUBS. Baby tigers have vision to see in the dark. The family carry the cubs. Nov 15, 2010 CATS RULE! I am a lover of any cat Big or small. I wish I could keep one of every type of cat. I should say the only one I'm not real fond of is the hairless, other than this breed I LOVE all CATS.It's just so sad that mankind is building in these beautiful animals habitant and they are being left with no where to live. they are so cute i could just jump in and get it!!! baby tigers are so cute.they are my favorite animal.i want one. Sep 24, 2010 CUTEST THING EVER!!!!!! 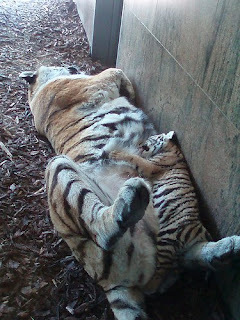 Tigers are so cute, u should put more pics on ur page. I love the snowy tigers. They're so fluffy!!!! Nice pic up there, i want 1!!!! How do get a baby tiger? i wanna know!!! are they free? oh, by the way, who ever the creator of this page is, not to be rude but, i think you should add more info. this is a great website. i will use it 4 my school work!! thanks!!! i just love baby tigers they are so lovely to look at and i love the big tiger cat also god made such wonderful animals for us to enjoy. love alisamaree. May 13, 2010 ssssssssssoooooo cccuuuttee!!!!!! May 11, 2010 They are so CUTE!! Tigers are my favourite animals. 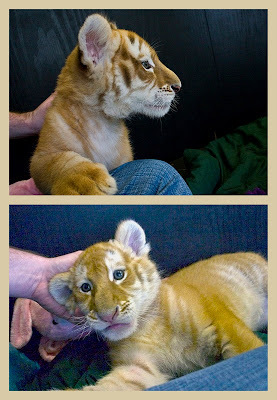 I´d like to have a baby tiger for pet. What a shame they are in danger if extinction. OMG, this tiger is the frickin cutest tiger ever OFG!!!!!!!!!!!!!!!!! Here is a nice Bengal tiger cub from an Alabama zoo. I think the cub is a man made version of the Bengal tiger. I think these tigers are called "golden tabby tigers". I personally dislike that but he is very cute. OMG that baby tiger is soooo cute. I know better than to think that I could/should keep one of these babies. But, I sure would love to play with one for a while. Baby tigers are incredibly cute but that should result in them becoming pets. I hope you agree. Too cute because some people have to have one with unforeseen consequences. They are extremely cute and you are not alone in wanting one. But we know that they grow into v.large tigers that cost a fortune to care for and which are completely unsuited to being cared for in a small private zoo or treated as pets. Glad you are 15. I want you to fight for all cats including tigers. They need people like you. I love tigers too. We should all love tigers more because not enough people love them. they are so adorable…..I don’t understand how or why anyone could mis-treat them . They’re gorgeous animals ! Sigh..people are capable of almost anything. Ordinary people I mean. And just wanting to ‘own’ a baby tiger is bad. It is the wrong attitude. We should not be seeing baby tigers. They should be in the wild out of sight. Thanks for the comment Sherri.